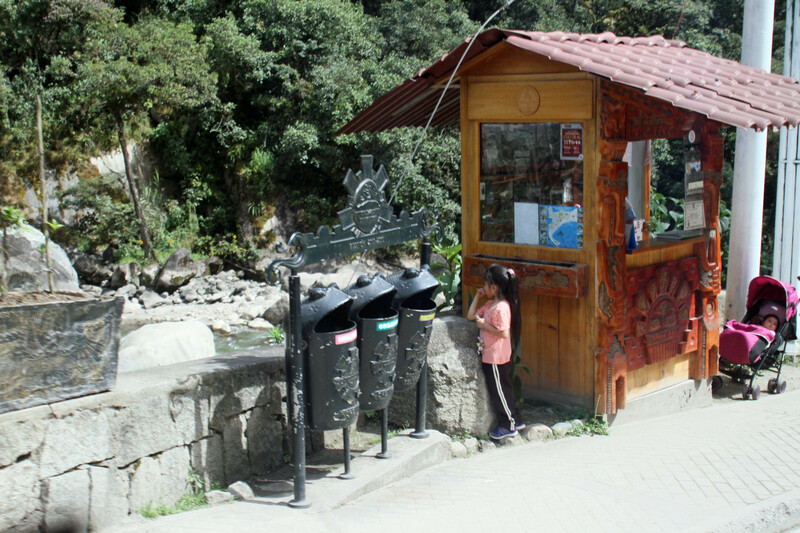 Stampeding lamas and hiking the Inca trail. 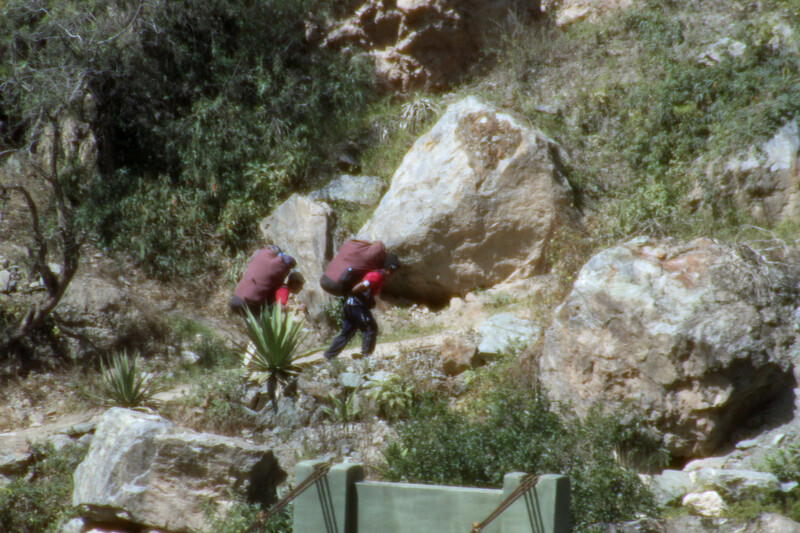 Two porters start out with huge packs on the Inca trail. 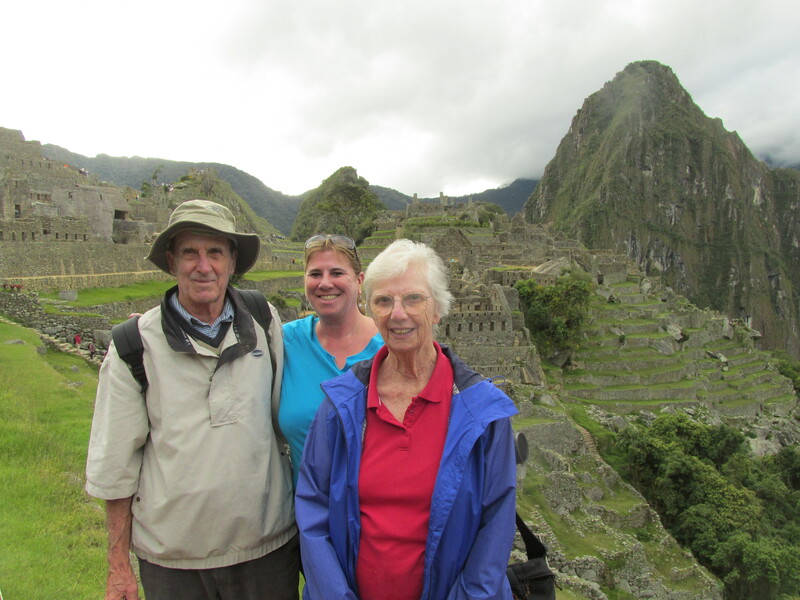 Our Peruvian adventure continued with a train ride through the countryside to Machu Picchu. 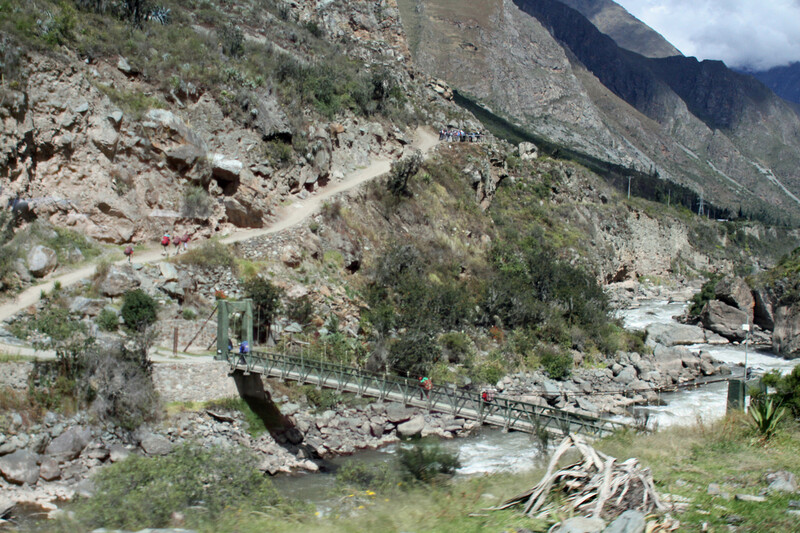 Along the way we passed by the beginning of the Inca trail. 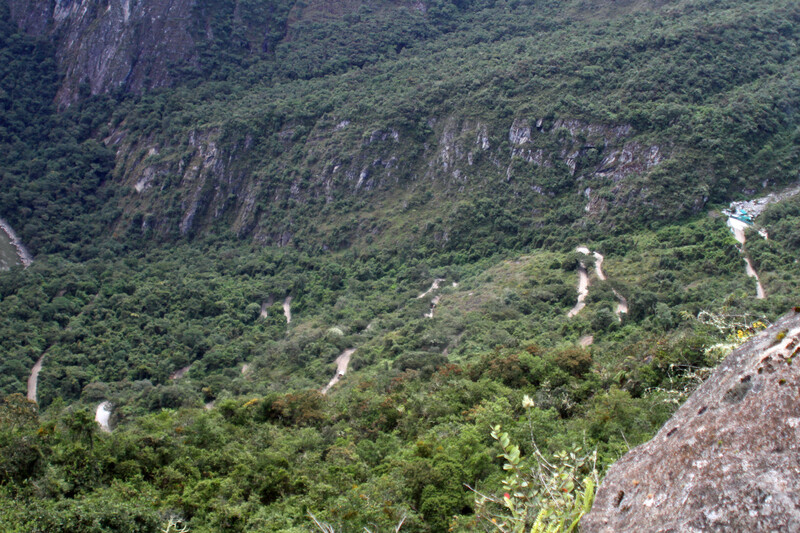 This is the 28 mile trail people hike to Machu Picchu, but the entire “trail” is much longer and starts back near Cusco. 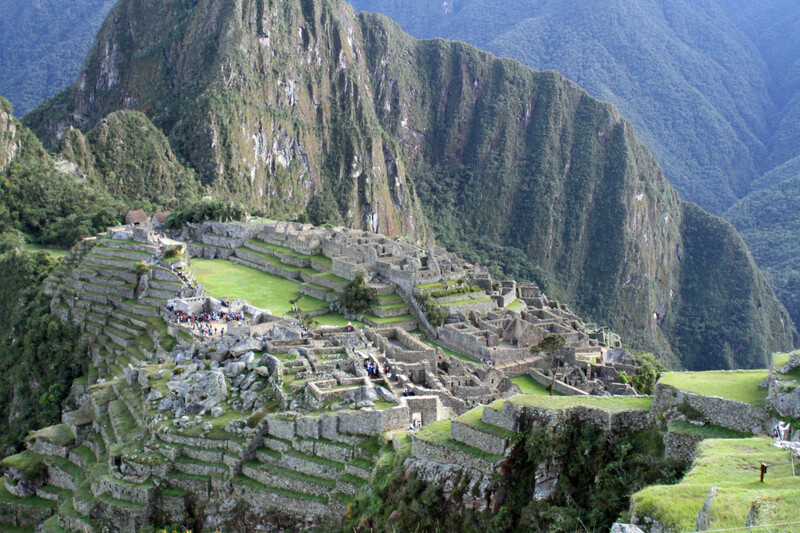 In fact, the Incas actually created 24,000 miles of trails through South America. The people are more adapted to the elevation and can handle the hiking better than the rest of us. How they carried their stuff or walked on the uneven stones without hurting themselves is a mystery. 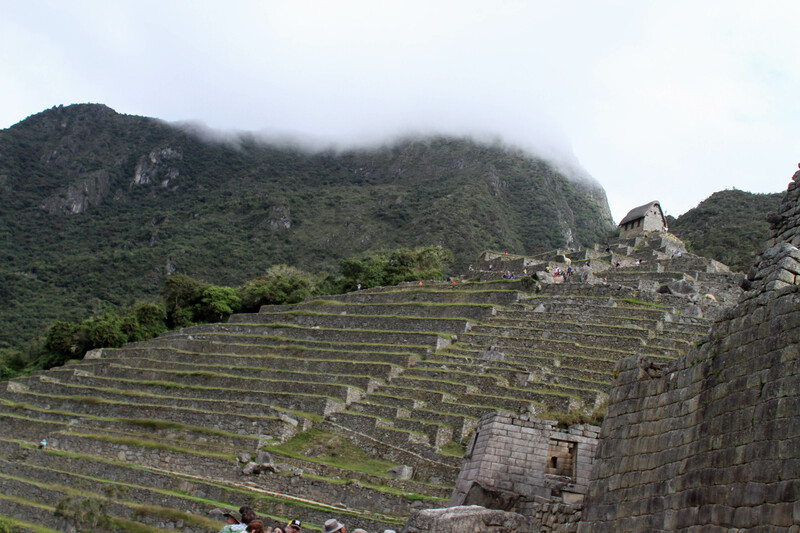 The town of Machu Picchu Pueblo at the base of the mountain. 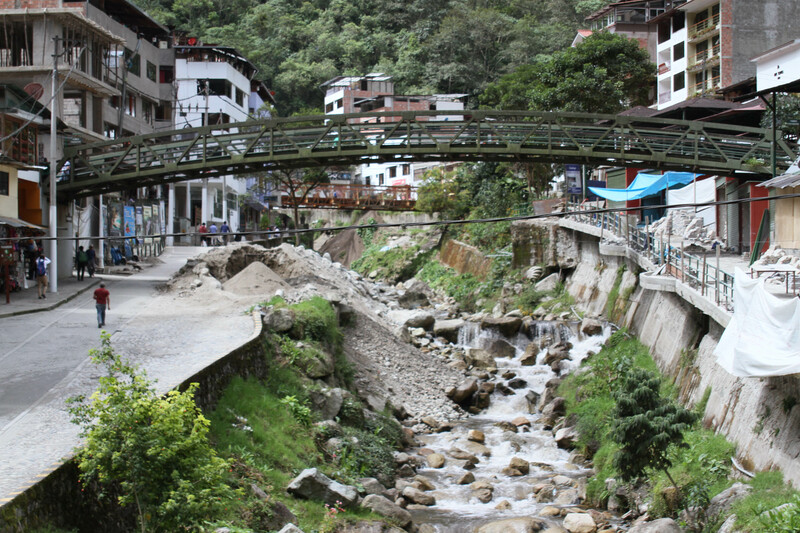 The ride along the river to the mountain was filled with gorgeous scenery and when we pulled into the town at the base of the mountain, I was amazed at the smells—good food cooking, all the hotels, buses, people, guys hauling drinks and supplies, and a market jammed with stalls of people selling lots of souvenirs. There’s not a lot of room in that valley and with so many more visitors showing up every year, it’s packed to the gills with entrepreneurs staking their claim. A view of the winding road leading up to the mountain. We got on one of the many buses making the loop up and down the mountain. 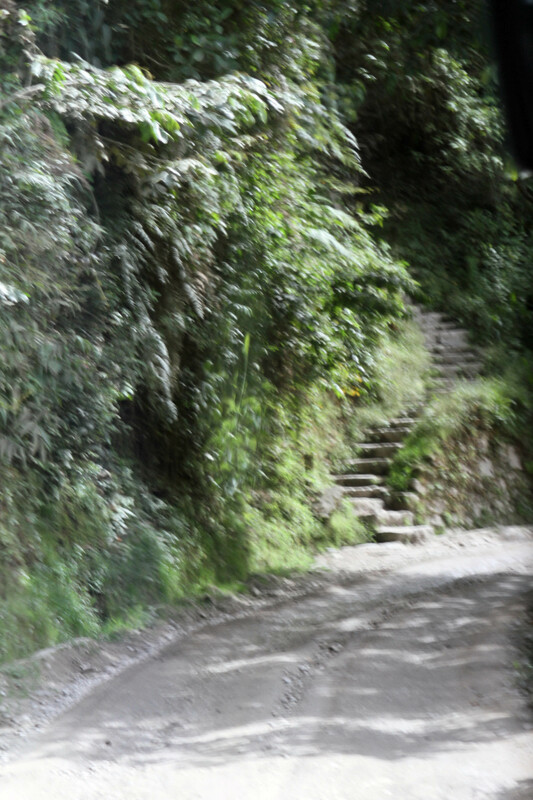 I was glad the drivers were so experienced because the winding steep climb took my breath away. 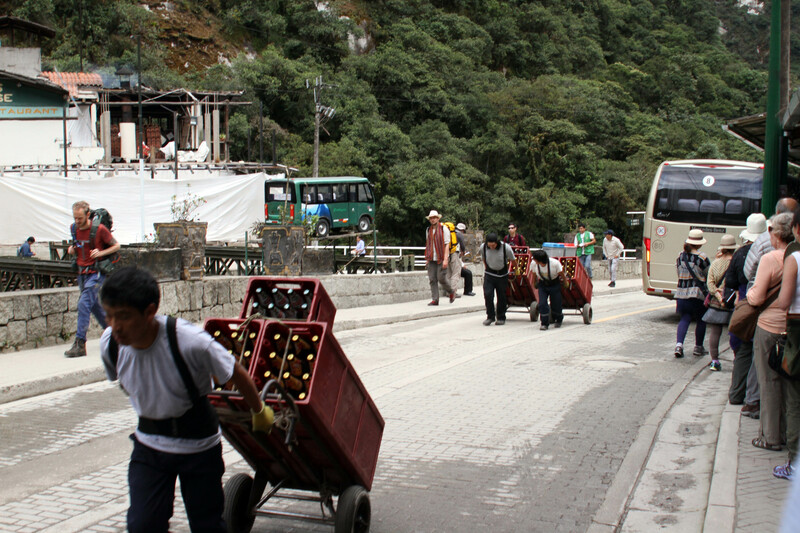 They had to be careful passing other buses and watching out for hikers who were walking up and down the mountain. Hardy young people for sure. Once there we checked into the one hotel with limited rooms located at the entrance of the park and then headed in for our first view of this magnificent archaeological find. For some reason we had to show our passports to get into the park (but got another stamp)! Our guide Diego took us around the main part of the park and I was so glad to get views of the entire community. Most people only see the one “National Geographic” shot from the top. 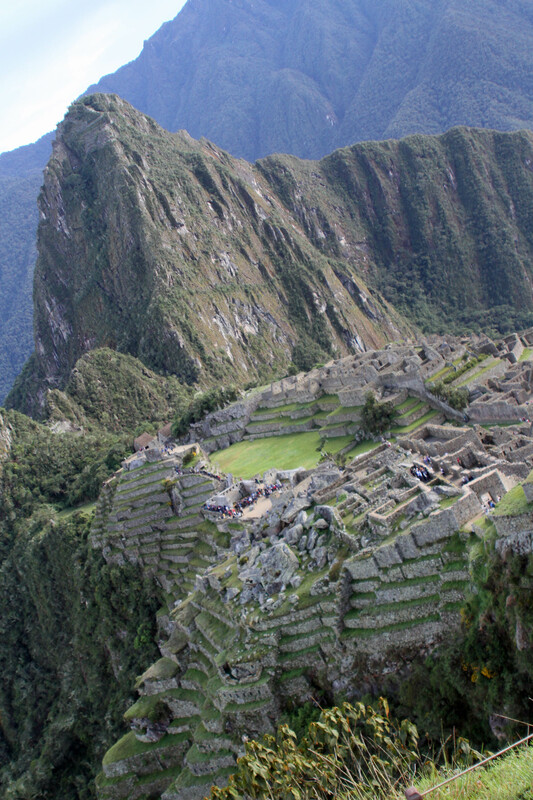 It’s amazing how big it is and how they were able to build out so many terraces down the side of the mountain. 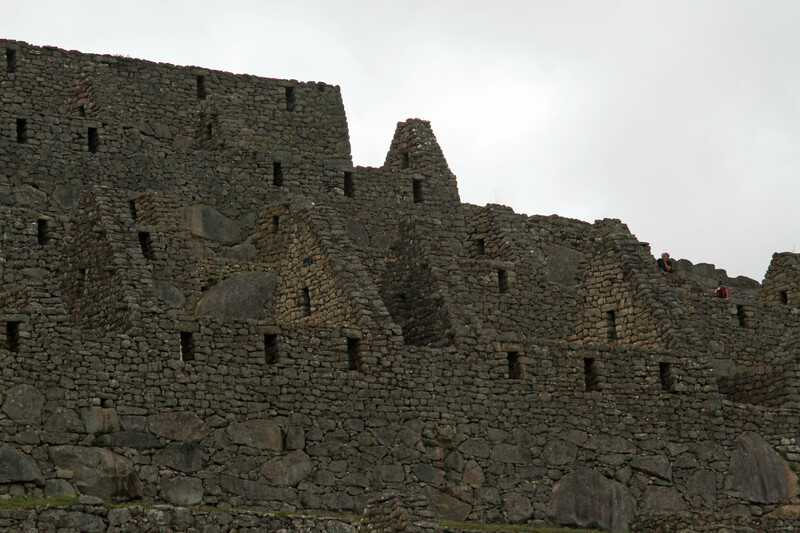 The people who lived here were the upper crust of the Incan society. Most likely the “court” of a King. 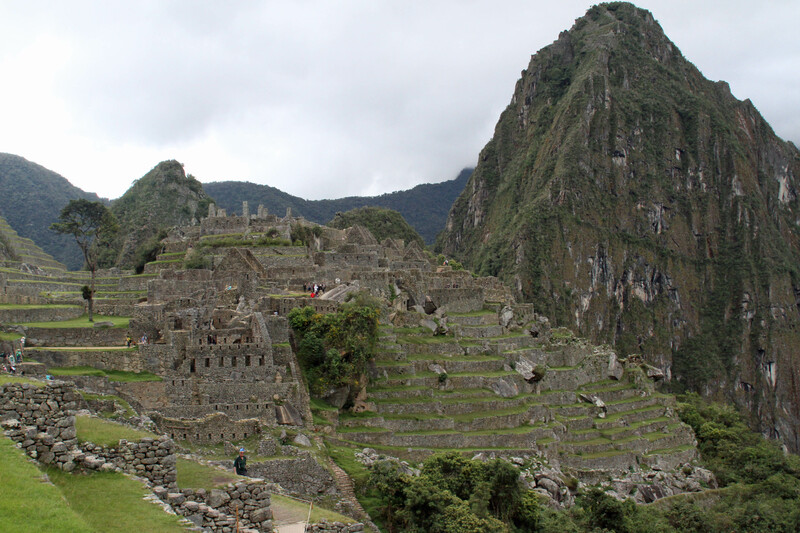 In fact the people weren’t actually called Incas—only the King was the Inca. He had a house (a room that probably had a “bathroom” and a “bed” near the temple and his wives stayed in another house/room next to his. A view of the community from the top. The buildings had very deep foundations. They knew how to build solid structures to withstand earthquakes. 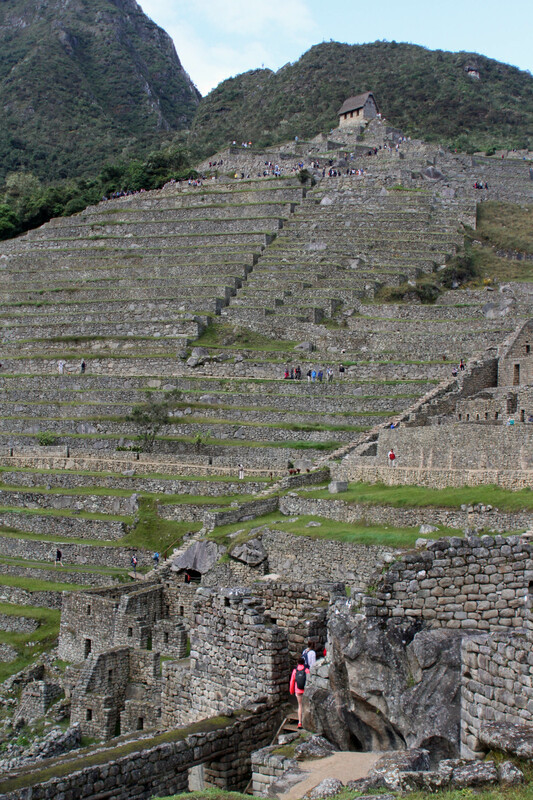 And they built out the terraces instead of digging them out of the side of the mountain. There was an area with a number of loose boulders which was probably where they got all the stones to make all the buildings. On a hill in the community, they built what looked like a sun dial but was probably for ceremonies as sound traveled easily to the open plaza below where the people probably gathered. 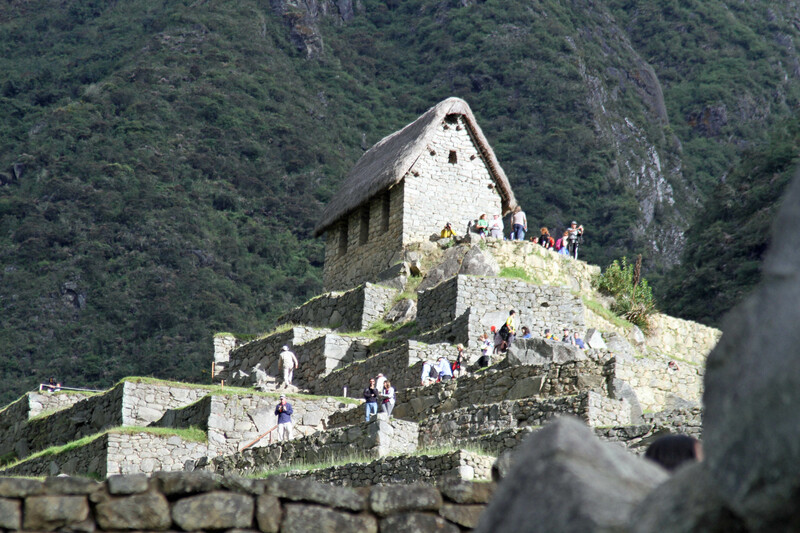 A view of the terraces and the guard house. After a nice evening with our tour group partners and some Alpaca steak for dinner, we got up early the next morning and hiked up to the guard house for that famous view. It was a brutal climb but worth it. 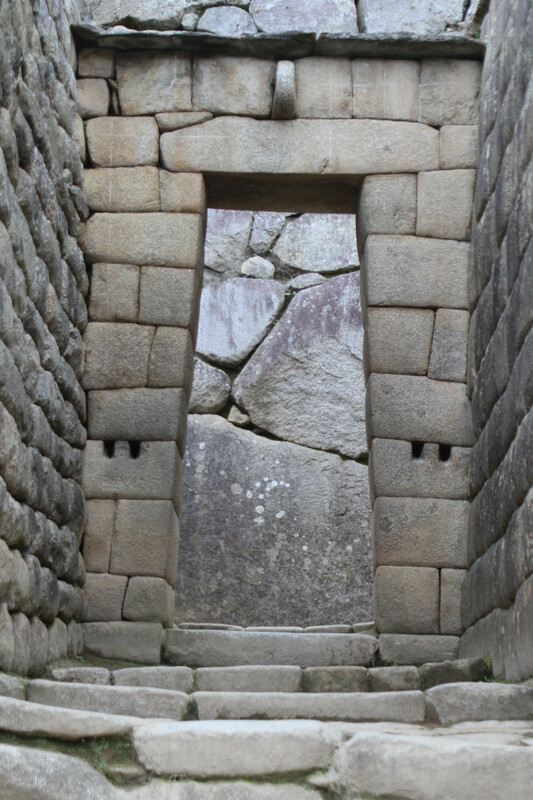 We got a view of the sun gate, where the Inca trail hikers come through—at the very top of the mountain, and went on to see views of the surrounding mountains and the entire complex. Wow. 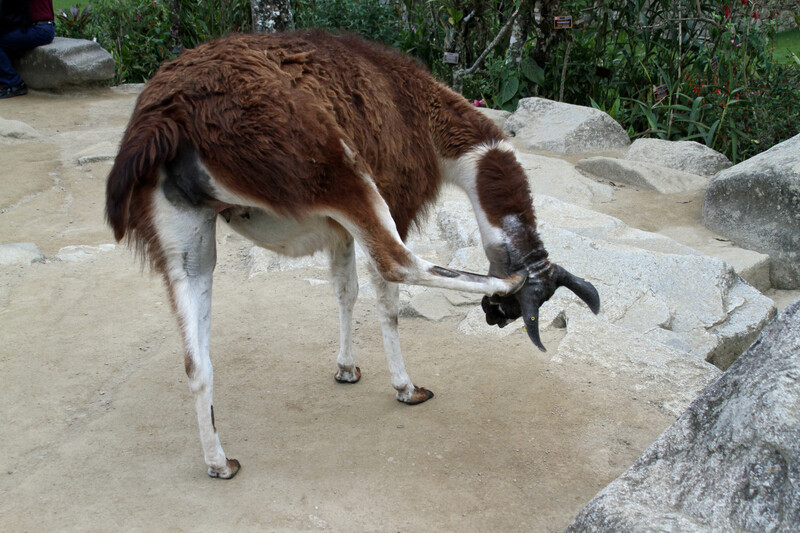 After stopping to pet an Alpaca, we went down some treacherous steps, where I twisted my ankle a bit, to the lower section of the community called the Temple of the Condor. They considered the condor part of their spiritual realm so this section was where they buried some people and also served as a dungeon for prisoners. 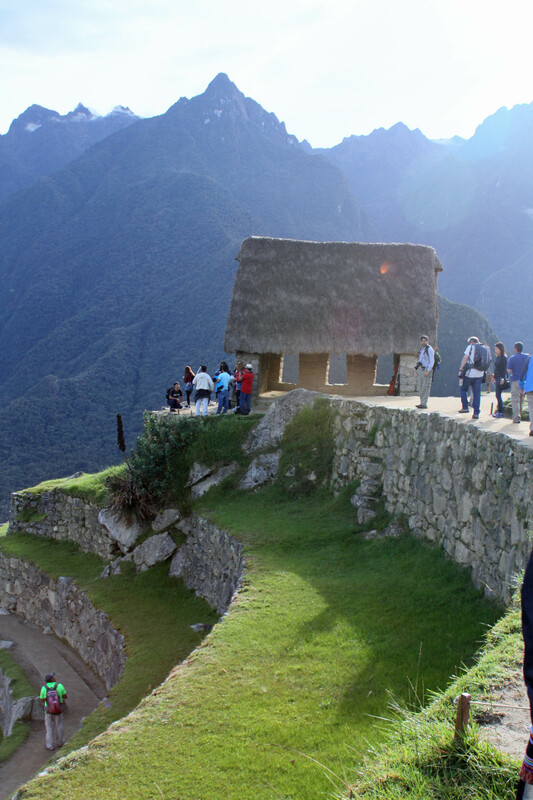 The guard house at the top of Machu Picchu. 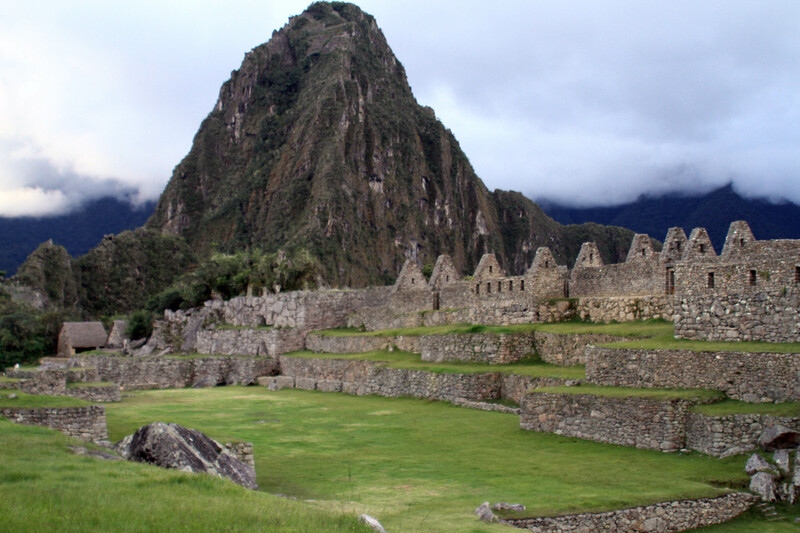 There is a book written by Hiram Bingham, the explorer who with the aid of some locals was the modern discoverer of the ruins. The book was a bit dry, but the explanation of how he got to the site and some of the history of the Incas was very interesting. 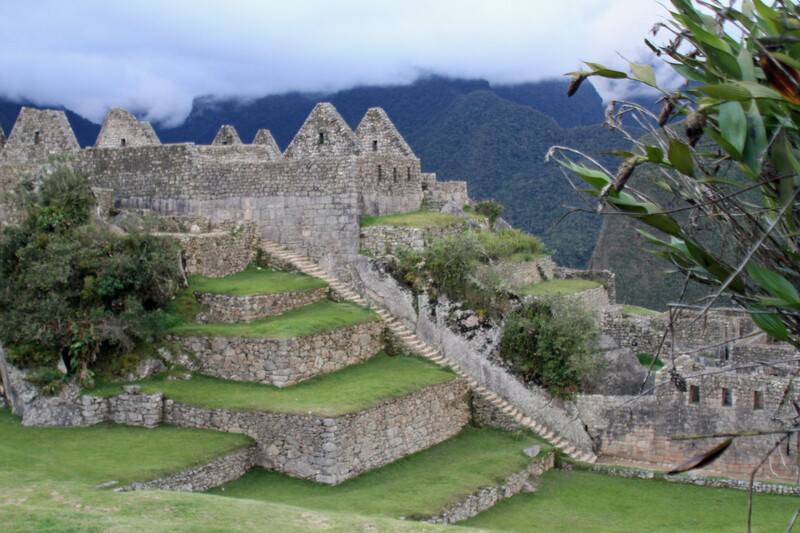 The fact that this site was hidden for so long is evidence of what a great defensive location it was during the Spanish conquest of Peru. Upon leaving the park on a narrow path near the exit we hear some exclamations coming from behind us—look out—ahhh and hear a lot of running-type noises. When I turned around and saw everyone suddenly leaning into the mountain, I was more than a little surprised to see two Lamas stampeding down the path. I was even more shocked when the guard just up ahead at the exit stopped them and turned them back toward us. I got some video of them running back into the park (see below). Probably just as well, because all the stray dogs that hang out at the entrance (that I fed from the buffet in the hotel) might have been miffed at the intrusion. 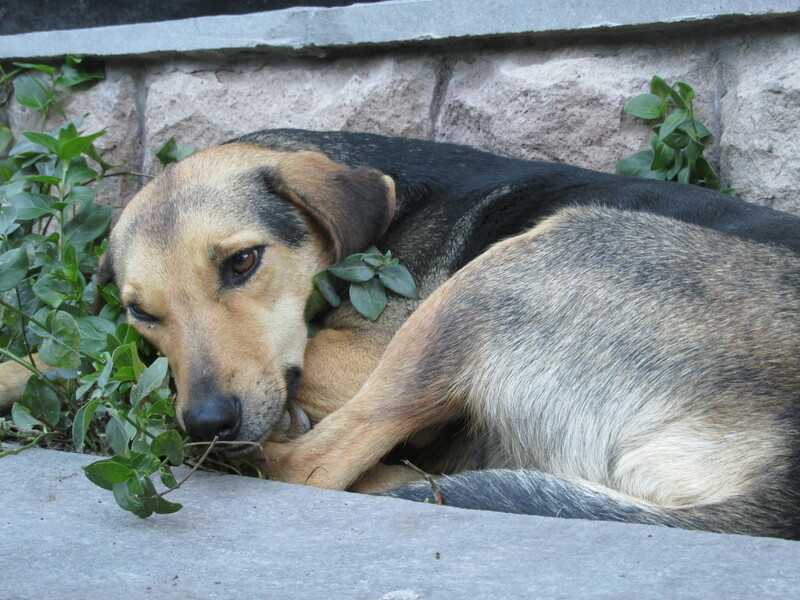 They were so laid back and would sleep right in the middle of the midst of thousands of people walking by. Yay, bucket list check! Many years on the wish list, I waited until I was fit enough and glad I was since it was hard walking in high elevation. Also glad I did it now, as more restrictions are going into place. Now, back to Cusco and off to the land of Darwin. The dogs hung out all over the hotel grounds and entrance to the park. 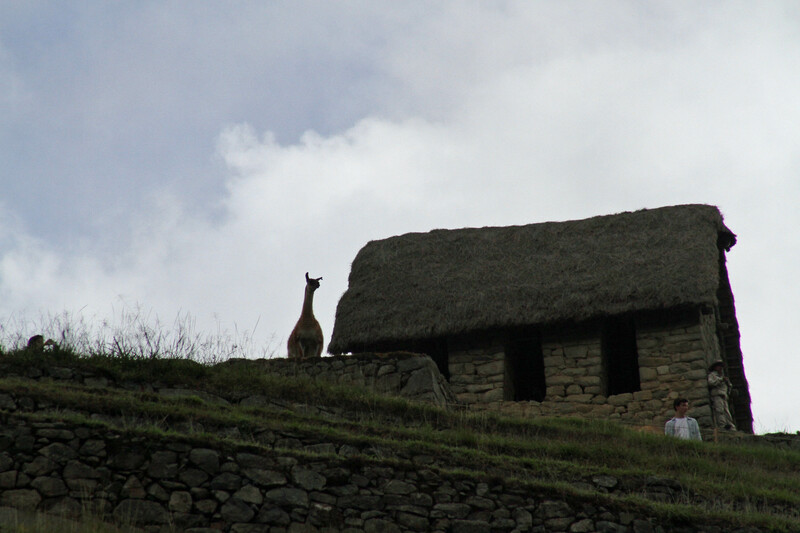 A lama at the guard house. 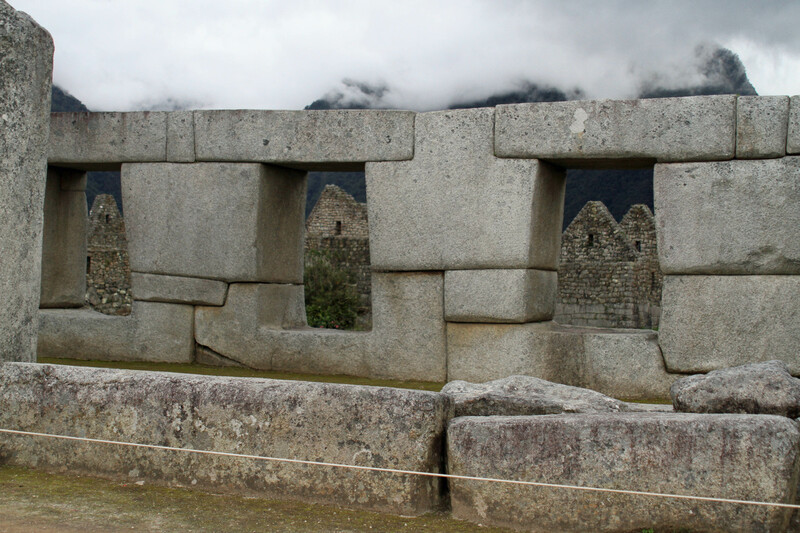 Temple of the three windows. A new across the plaza from the temple. 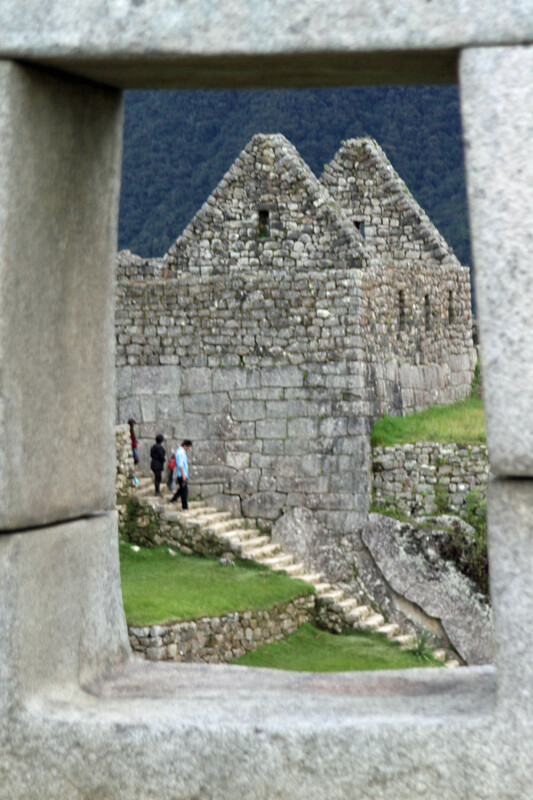 A view of the left side looking at Huayna Picchu beyond where a few hundred people a day climb the ruins. Another view of the end of the plaza and residential area. A view of the terraces and guard house. At the base of the mountain. 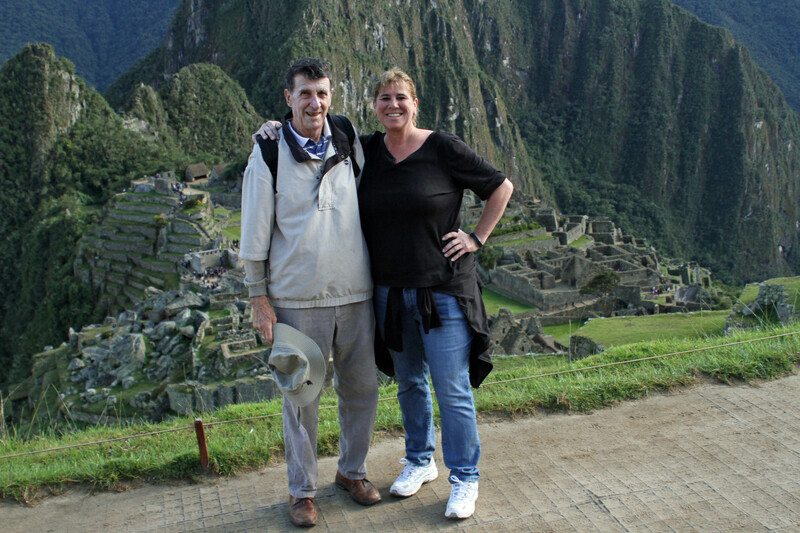 Dad and I near the guard house at Machu Picchu. 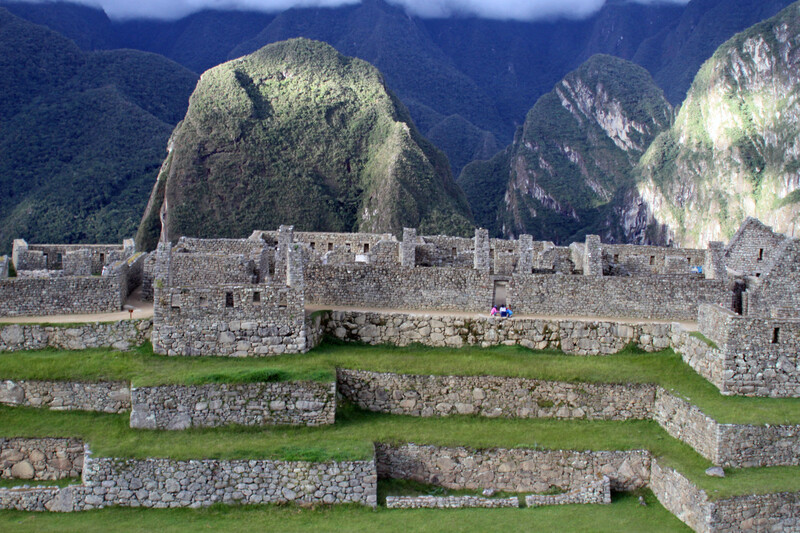 The Inca trail that leads from the sun gate to Machu Picchu. 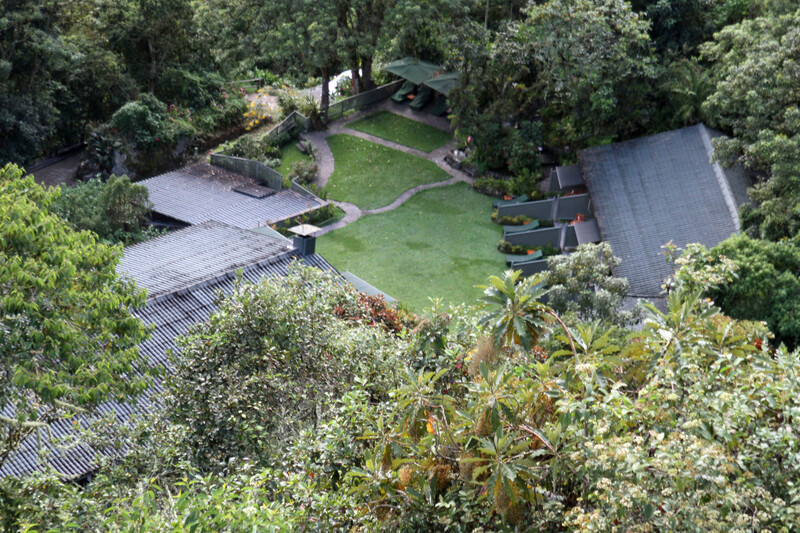 A view of our hotel from above. Our rooms are hidden by the trees. A view of the main plaza. A view of the gate house from below. Our first view of the park. 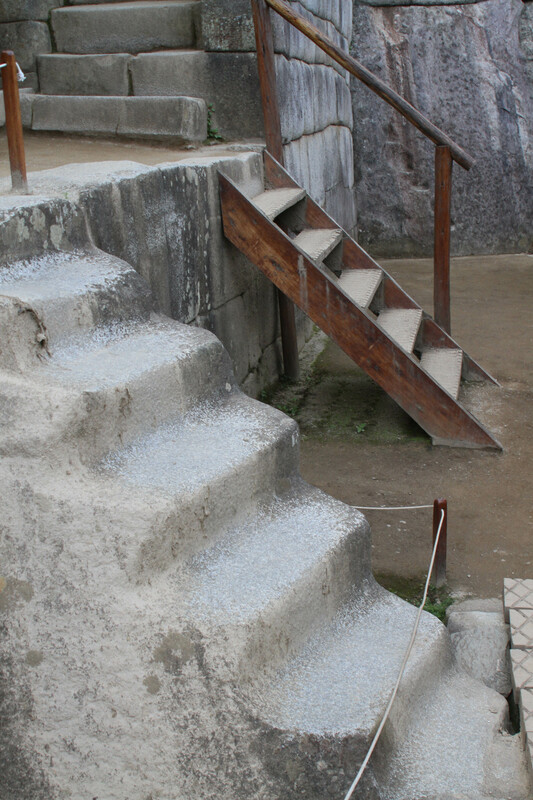 One of the stair cases leading down the mountain. The trash cans looks like frogs. 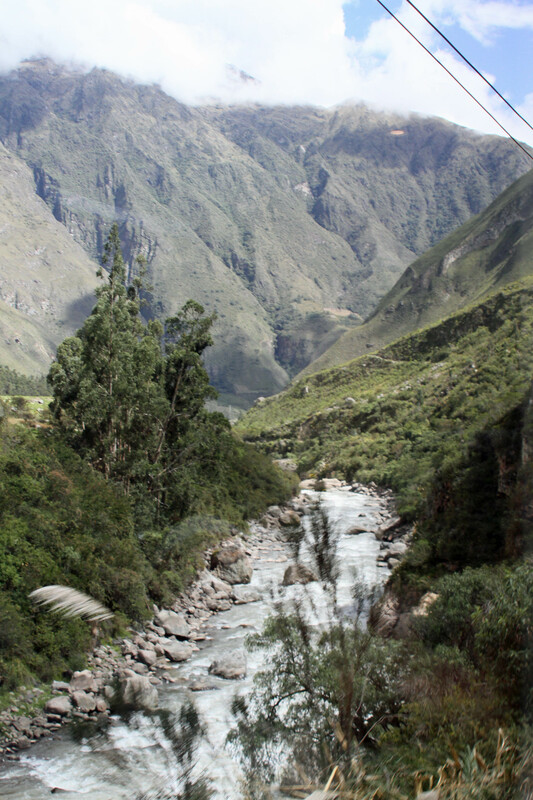 A view along the river on the way to Machu Picchu. 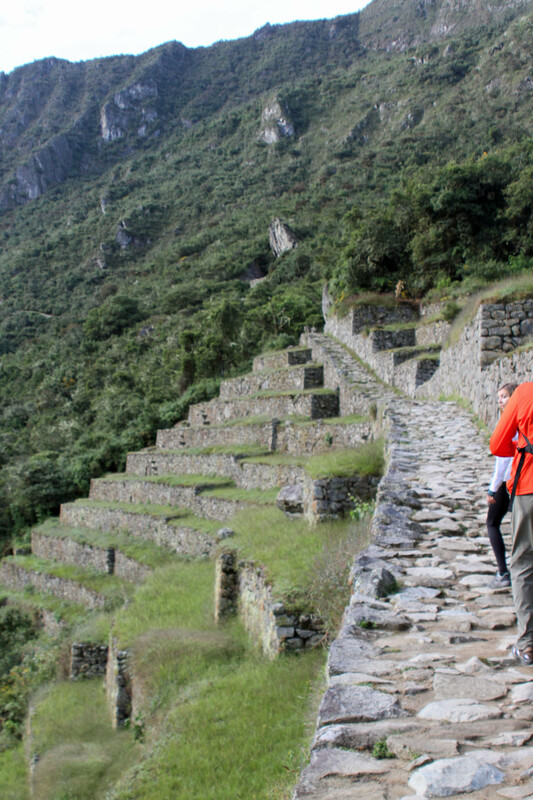 The beginning of the Inca trail leading the Machu Picchu. 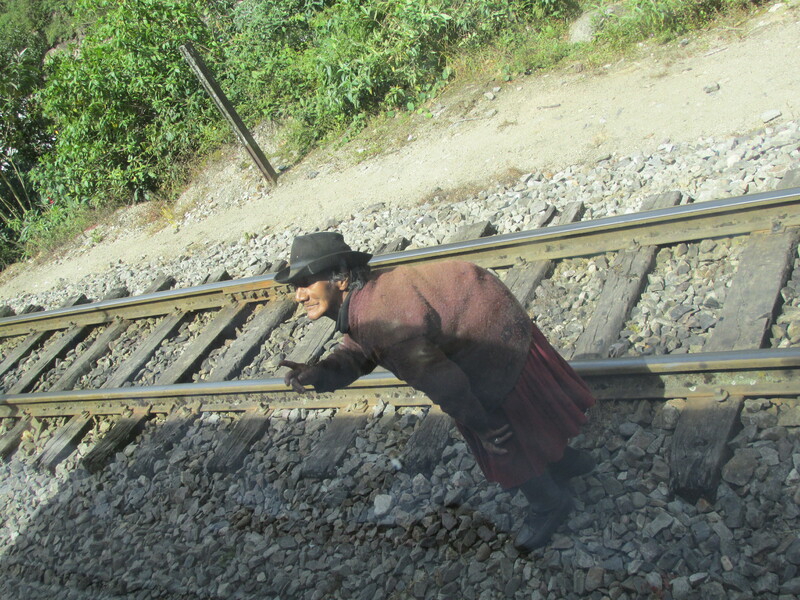 A Peruvian woman outside our train. 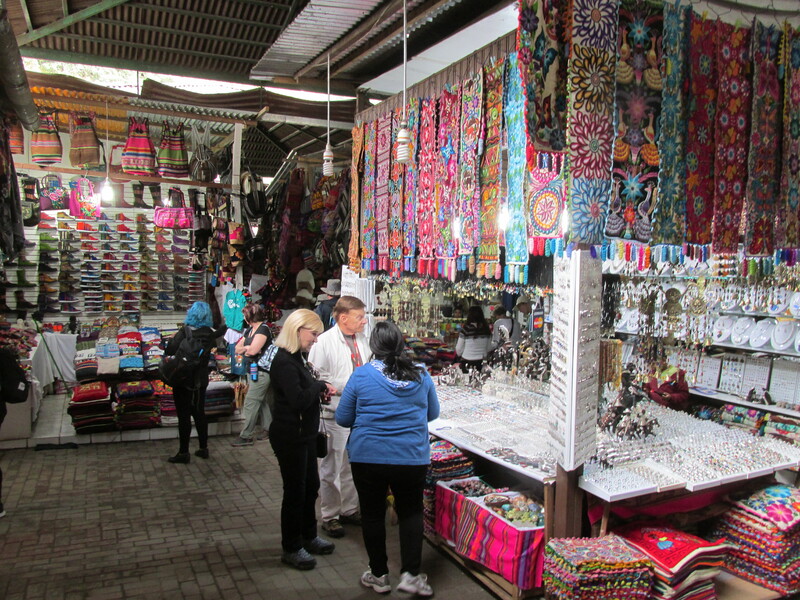 Some market stalls at the base of the mountain.